The components of a planner that work for virtually anyone are actually simpler than you think. The ingredients include a calendar, task list, paper/idea capture, and a file for information. That's it. I like my planner on paper, but a computer or smartphone will do, if that is your style. Maybe you have a planning area in your kitchen. Maybe you have a spiral planner or a ring binder. It doesn't matter. If you have these parts to your system, you can consider yourself a plannerd and can tackle anything. Have a calendar to note dates and times. And then, well, note dates and times. It's funny how many people fail at this step. They believe that they will remember when the dentist appointment will happen. Or they search all over for that little card, only to discover that the appointment was yesterday and they owe a $50 skipped appointment charge. Write it down when you schedule or find out about it. Have a place where you write down anything that needs to be done, unless you a) do it anyway regularly or b) are doing it now. Of course you can be complicated about this. Or you can just designate a legal pad and keep a running list. What matters is that you don't keep it all in your brain. Your brain does NOT have that much room. Have some paper for planning - projects for work, holidays, errand days. Whatever you need to plan, it's easier to think it out on paper (or screen). Okay, I need a lot of space for things like my medical history (convenient at the doctor's office), exercise class schedule, and blog ideas. But you get the picture. Have a portable place to put that information. It is important that all of the ingredients are put together in a place that you can easily access and that you love to use. Think of it like using a soup bowl for soup. If you don't have a soup bowl, you'll probably never make soup. I have a beautiful, light blue leather compact planner, but decide what speaks to you. If it's your iPhone, that is alright, as long as you don't mind the input or the layout. Make it fit you and your life. 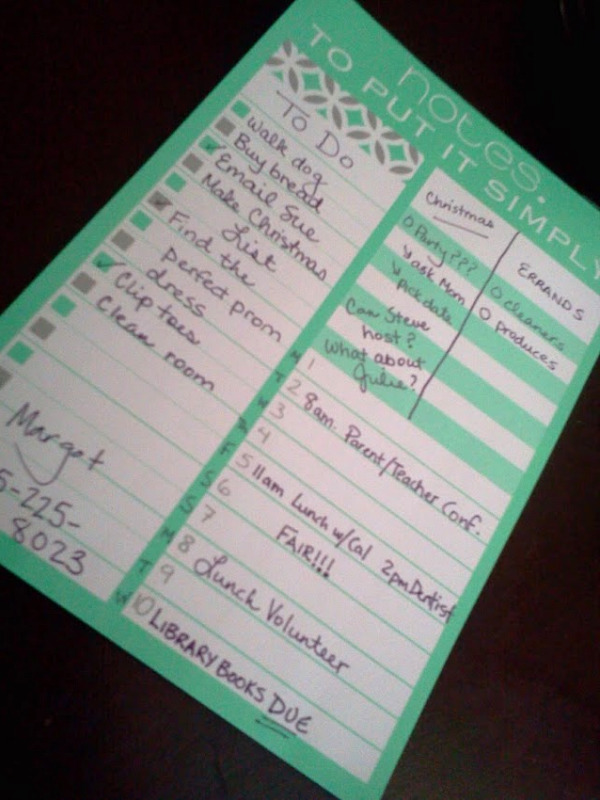 This is the overview picture of a very simple planner notebook as an example. But I like something fancier and with more writing space...something more gourmet. Join the Giftie Etcetera Facebook Group to talk about how you make the recipe work for you. Ohh you are using Plan Ahead inserts <3 <3 <3 I haven't been getting notificatios of your posts and I didn't read a tone of it! :-( I will read this one tonight. And also do some catch up. Thank you. I cannot wait until I have my Plan Ahead!! A friend who is in the USA now will bring it to me in November. Roll on time! Thank you Kristy, WONDERFUL lady! !